In this "clicker" case, based on a TV drama about a family secret that only knowledge of genetics can solve, students apply what they have read and heard about genetic diseases to determine familial relationships and predict the chance that a family member has inherited a genetic condition. 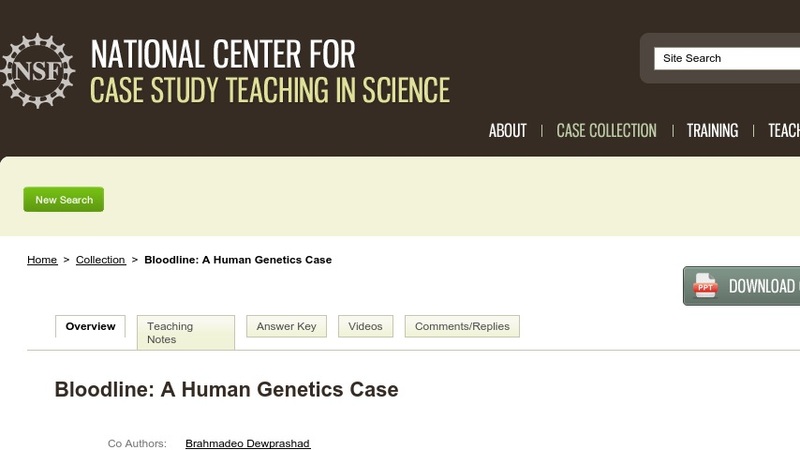 The case is designed for use in a one-semester introductory biology course taken primarily by freshmen and sophomores to fulfill a general education requirement, but it could be used in any introductory biology course to help students understand and practice applying concepts related to human genetics. In addition, the case could be expanded or modified for use in a genetics or anatomy and physiology class in which human genetics and pedigrees are taught. The case is presented in class using a PowerPoint presentation (~1MB) punctuated by questions that students respond using "clickers" before moving on to the next slide. It could be adapted for use without these technologies.